With summer here and the occasional spell of lovely dry weather I am getting asked by more and more people about how to remove the smell of dog urine from an artificial grass lawn. Basically what is happening in the summer months is the lower levels of rain is causing the ammonia from the dog urine to become more noticeable leaving the garden owner with a great looking lawn that smells. For years I have tried and tested many products to find the best answer to this problem. I will go into more details on some of the products I have tried below. I will also reveal what I think is the best, environmentally and pet friendly solution to rid you’re lawn of the smell of urine. To give you a little background to my testing I have 3 male dogs of my own and a medium to small sized back garden lawn (25m2) fitted with the Spring artificial grass product. I have installed the artificial lawn in exactly the way shown in my blogs. The tests have been conducted over the last 12 months since I fitted this product. An established cleaning brand that offers a general outdoor disinfectant. The main problem with this product is that I found it was far too pungent leaving me with another smell to get rid of. This consumes a lot of water and needs to be done regularly in the dry months. A problem if there is a hose pipe ban. I found it works well but it leaves a sweet smell of bubblegum. This works well diluted in water. I left this on for 10 minutes before rinsing off. It leaves a vinegary smell and the urine smell is quick to return. They quite simply make the smell worse. If you look on the Internet there a literally hundreds of so called ‘urine cleaning products’ on the market. I have tried many but I have found that the products I have tried will get rid of the smell by covering it up and the odour will return in days. A good membrane needs to be placed underneath the foundations of the artificial grass not directly under the grass, as this will simply trap the urine. There must be a good solid sub base of Type 1 followed by a top layer of granite dust. This will enable better drainage and give the urine the chance to soak through. 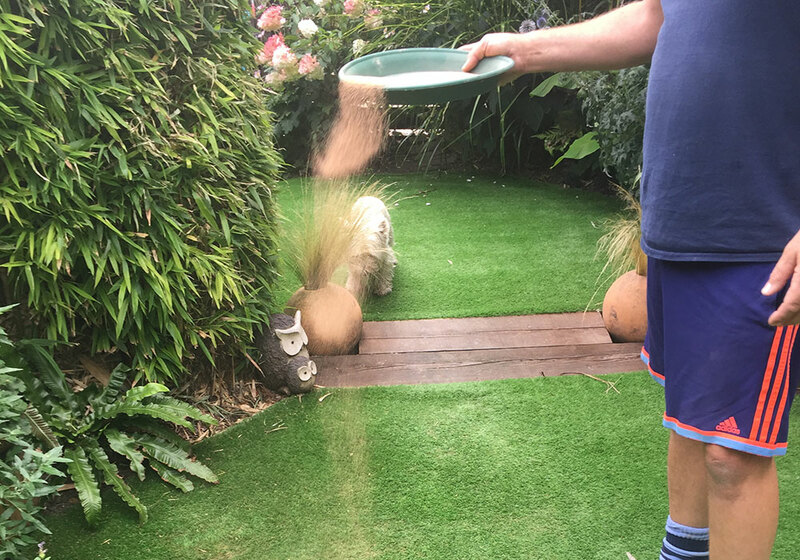 I have been testing a very fine sand top dressing that I have called ‘Artificial Grass Dog Wee Sand‘ over the last 3 months. I simply sprinkle it on top of the artificial grass and brush it in with a plastic leaf rake. 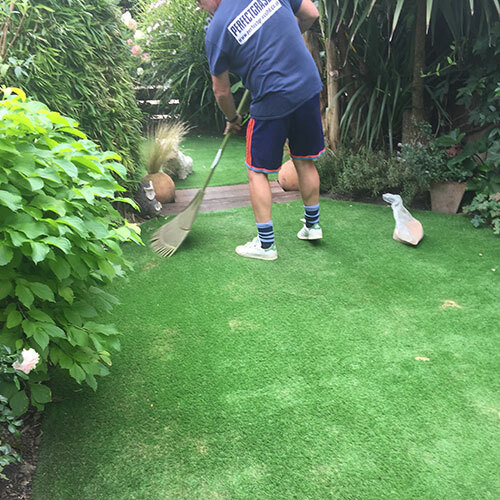 I don’t use a metal rake as it will pull out the fibres from the artificial grass. I have found the sand absorbs the urine and holds on to the odour and it really really works. I don’t know the scientific explanation for this but I highly recommend it. I have only applied it once in the last 3 months during this very dry period so it’s not a question of having to do it every time it rains. You can see details of the product here. Because of the size and weight (20kg bags) the product it is collection only. Please call first. If you are getting artificial turf laid in your garden and you have dogs or other pets make sure you ask your installer how they intend to deal with the potential issue. If you have found other successful ways to remove the smell of dog wee from artificial grass please share them in the comments section below. is this available in the U.S by chance? I’m in Denver, Colorado. Urine Free is the only thing I’ve found that works. However, it’s a process. We were told the dog urine will just filter through and out the base. Of allt he things I know dealing with pet urine, it crystalises and you need an enzymatic cleaner to get rid of the smell. Is there anyway you would consider a postage service?? It sounds like I need this product but its just getting to you ! Please can you tell me whereabouts in London you are based, In order for me to collect the sand? Hi there we are based in South East London , Bexley . However please note we are not a manned yard/shop as we specialise in installation and trade sales so don’t just pop in on the off chance. I am normally here first thing 7- 8.30 am Monday -Friday . I am shut at the weekends. Hi the sand is so fine and you don’t use that much , simply top up as required little by little , around the surrounds mainly where the dogs wee. So will it remove the smell that’s already there or will this only work if you use on a newly laid lawn ? hi ,I would suggest if the lawn is quite bad maybe giving it a light pressure wash , then when it is dry adding some of the sand .It works extremely well but please don’t think for minute it will save all the problems if the lawn has been poorly installed. We are travelling back from France on a Sunday are we able to collect on a Sunday morning? Hi unfortunately we are not open On Sundays. 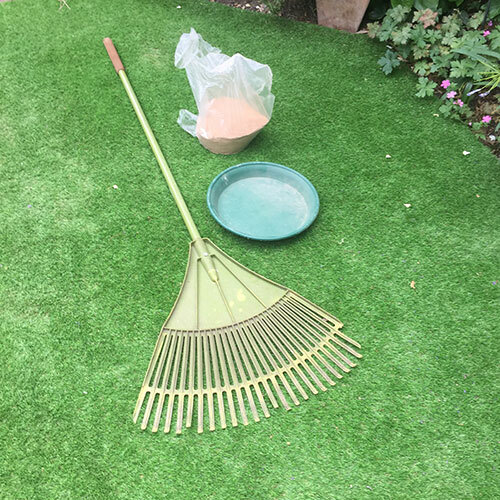 We have false grass but as we’ve not done much with it our dog wees on the lawn daily but we use a bowl for him to wee in but obviously accidents happen we tend to just put water there where he’s weed but when the weather is hot we can smell the urine and it stinks. Can I get the sand from b and q and what type. Our dog is a staffie. Obviously we need help as it cost us. Lot of money this new lawn. Need help quick. Will the sand stay on the top of the grass as I don’t want my dog to have sore paws as he’s got sensitive skin. Hi there , no you can’t get it in B&Q as it is a specifically made top dress product that holds on to the ammonia in the urine. With anything like this there are chemicals in the product for it to work, which have been thoroughly tested so they do not harm the animal. I have used it for over two years with my three dogs and its amazing. However the grass needs to have been laid correctly in the first place, with the membrane on the bottom and a free draining base. How many square metres does 20kg cover please? Hi it will last you several years on an average garden as it is added very lightly in the worst areas where the dogs wee. It is added like sowing seeds so will last.